New Orleans Neighborhoods Scrabble For Hope In Abandoned Ruins Hurricane Katrina obliterated homes and drove out residents. Ten years later, the city is still struggling with how to handle the blight that remains in some wards — scars of an uneven recovery. 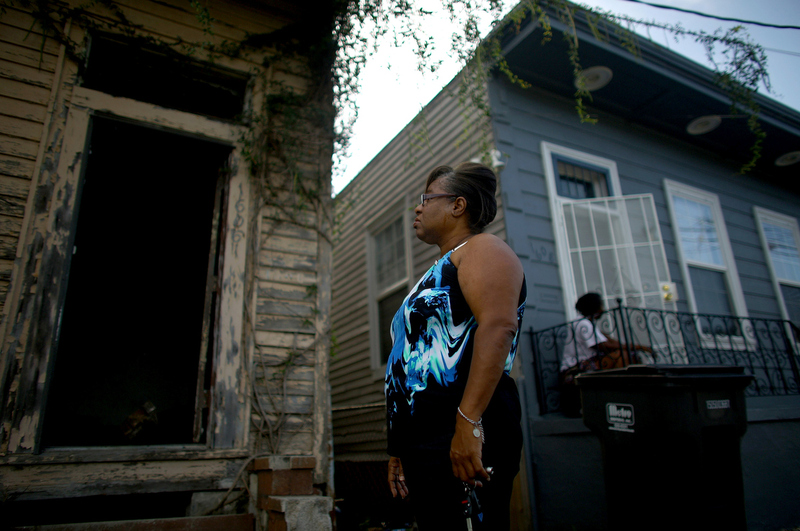 Angela Chalk looks at a home in New Orleans' 7th Ward that hasn't been touched since Hurricane Katrina. Chalk, the vice president of the 7th Ward neighborhood association, spends some of her free time tracking down and reporting dilapidated and abandoned properties. "When you walked on it, it was just crunching," Chalk says. "Sounded like you were walking on cornflakes. And it was just caked everywhere." For Chalk, rebuilding her place was a four-year journey, complete with financial help from Louisiana's Road Home program. Like a lot of people, she's still fighting with a contractor who took her money and didn't finish the job. But she says there was never a question that she would rebuild the house her grandfather won in a card game in 1942, in the same neighborhood where she was raised just like three generations before her. 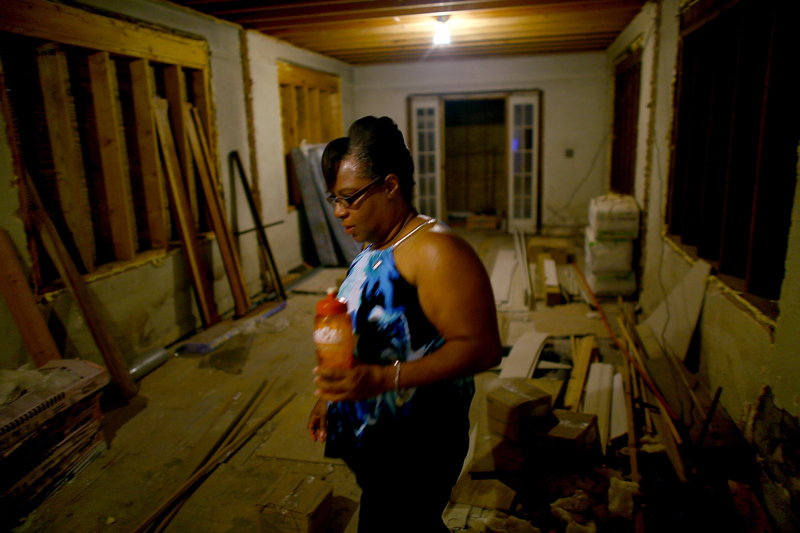 Angela Chalk walks through the still-unfinished ground floor of her home in the 7th Ward of New Orleans. Her current residence sits atop the old house, which is part of the new code for property owners who are rebuilding. "Yes, we are Creole. Yes, we are hardheads," she admits. "And yes, we will remain here because this is where we chose to be." Now her mission is to help the rest of her neighborhood. "It's slow to come back in the inner city," Chalk says. "The CBD looks well, and when people see the CBD they think we're all healed and we're not." The CBD is the central business district in downtown New Orleans, adjacent to the French Quarter where visitors tend to flock. It's now bustling with investment and construction. The picture in the 7th Ward is more bleak, though. 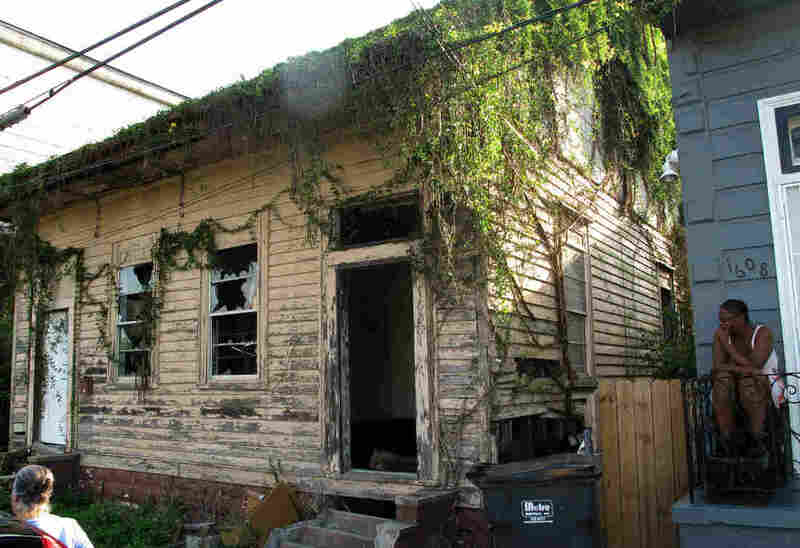 Ten years after Katrina, boarded-up homes and weed-covered lots remain. Chalk says three nearby houses collapsed in recent weeks, posing a public health hazard. That's a problem for New Orleans, where officials estimate some 30,000 blighted properties remain. Chalk says it has a ripple effect when people are trying to restore their streets. "I can remember one neighbor saying 'Oh, I'm not worried about that. We don't live there anymore.' But somebody does live there," Chalk says. "Some people — out of sight, out of mind. They try to put Katrina behind them and don't want to ever think about it again. But the decision that they make affects someone." Housing advocates say that in most cases, it's a matter of resources. "The less money you have, the more you got left out of the recovery," says Fred Johnson, CEO of the New Orleans Neighborhood Development Foundation, a group that fosters home ownership. "You had a lot of poverty that was stuffed and tucked and rolled, and people knew how to live with it," he says. But "Katrina ... exposed all of that." He says resiliency can't replace money, so the city's recovery has been uneven. Those who could afford to come back have; others still struggle. And now new people are moving into the city. Johnson says the dynamic is changing the landscape of traditional neighborhoods. "Everybody else is welcome," he says, but: "Don't let everybody else come in and get in and take up parcels of land, and then the natives is on the outside looking in. And they're saying, 'Well, I used to live there. Well, my aunt used to live there. Well, my daddy used to live there. Well, we used to.' 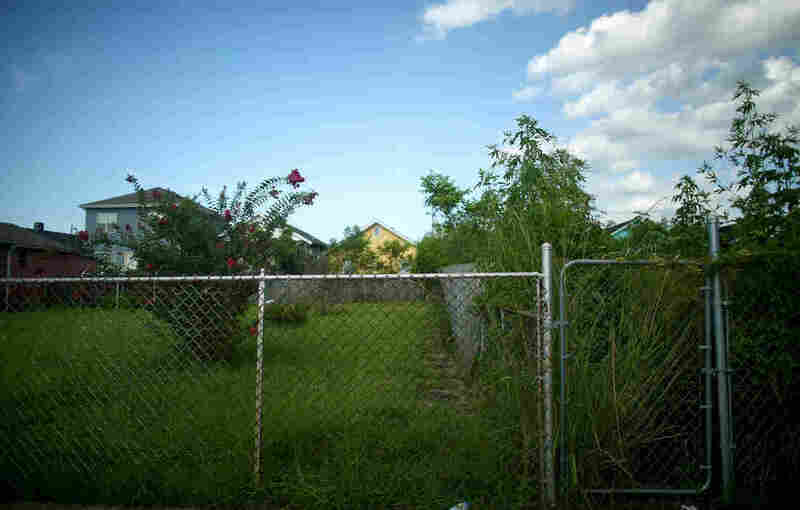 "
Where houses once stood there are now just empty lots and overgrown gardens in the 7th Ward of New Orleans. It's known here as the "jack-o'-lantern syndrome": A rebuilt house represents the teeth; a weedy lot, the gaps between them. Chalk sees a lot of "used to" as she drives through her 7th Ward neighborhood, pointing out blighted properties. Just around the corner is a wooden frame house that hasn't even been cleaned out since Katrina. You can see a sofa through the doorway. On the next block, just about every other house is empty. It's known here as the jack-o'-lantern syndrome. The rebuilt houses are the teeth; the weedy lots, the gaps between them. Chalk says that behind most blight, there's a story. "The people are still dealing with insurance companies, The Road Home or they have just moved on, just given up," she says. "And you still have people who are still fighting, 10 years later, to get back home." Chalk rides around taking pictures of the blighted houses to notify city officials of the ones that are deteriorating. She stops in front of a house with thick green vines completely covering the roof. The windows are broken out; the front door is gone. Inside, the floor has been ripped out and weeds are creeping up the cracked plaster walls. Some people ... try to put Katrina behind them and don't want to ever think about it again. But the decision that they make affects someone. "It really has to go," she says. "I'm afraid this one is going to come down." Knock it down, says Michelle Watkins, who lives next door to the run-down house. Watkins is worried about drug addicts using it. She's frustrated that it's still here after 10 years. "It's a problem because me and a neighbor, we get out here and pick up needles and stuff like that off the ground," Watkins says. "We all have children on this block." City officials acknowledge the lingering frustration. "We've still got a lot of blight. We're by no means done," says Deputy Mayor Andy Kopplin. He says the city of New Orleans is waging an aggressive battle against blight, and has made inroads. "We've either fixed up or demolished somewhere between 13,000 and 15,000 units, as a city," he says. But there's a racial divide when it comes to how people perceive their own neighborhood's conditions. A little more than a third of African-Americans say their neighborhood has a major problem with abandoned or destroyed buildings; only 10 percent of whites say that. Kopplin says the city is trying to clear blighted property through stricter code enforcement. And when people don't comply, the city can take them to court and seize the property for auction. In the courthouse lobby, tucked between the metal detectors and elevators, bidding is brisk at a recent auction for a commercial property seized by the city. Someone buys a blighted uptown property for $180,000. It's the former St. Daniel Spiritual Temple, which is now just concrete steps on an overgrown lot that the neighbors wanted cleaned up. While the city auctions off formerly blighted property, the New Orleans Redevelopment Authority, or NORA, is trying to drive reinvestment in long-neglected neighborhoods. NORA was created to tackle blight in the 1960s during urban renewal, but it confronted a much bigger mission after the flood — 150,000 blighted properties spread all over town. Director Jeff Hebert says that figure is down to about 30,000 now. Despite government and nonprofit initiatives, Hebert says, it's ultimately private sector money that drives redevelopment. He says there's been a legacy of disinvestment in New Orleans' inner city. "So that's a post-Katrina initiative — that we move forward with money to really invest in also the commercial side," he says. "So people have the services that they need, walkability, to create that holistic neighborhood." 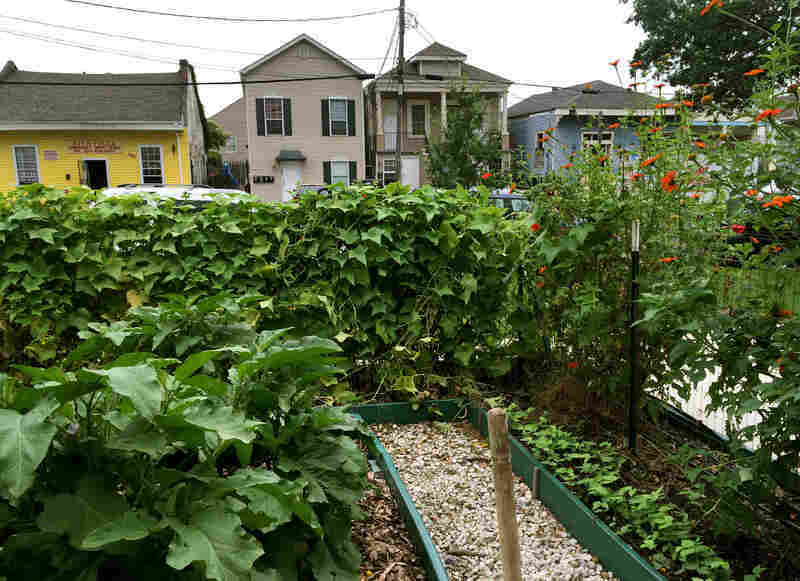 In a community garden nestled on Broad Street, Lexa Lee has a plot where she grows yellow pear tomatoes. The ReFresh Garden, a project funded in part by NORA, is right behind a Whole Foods Market that opened this past spring. Lee comes down a couple of times a week to tend to her crop. She says she was glad to see the new development in what had been a plot of concrete, graffiti and weeds long after the storm. "This neighborbood seems like it's particularly hit hard by blight. There are a lot of old, run-down buildings, abandoned buildings and this was a parking lot for so long with a building on it," Lee says. "It took a long time for everything to pull together and it's just dramatic." The Whole Foods opened this past spring — an urban format, touting more affordable groceries than the higher-priced versions of the store found in upscale neighborhoods. Jeff Schwartz, executive director of Broad Community Connections, a nonprofit group trying to revitalize the Broad Street corridor, says it's good to have a supermarket again in what had remained a food desert long after the hurricane. "It was almost a full decade after Katrina that this place finally got back up and running," he says. "It was a big, 65,000-square-foot vacant grocery store for a long time." In addition to the market and garden, the area also now has a children's advocacy center and a cafe that trains at-risk youth, called Liberty's Kitchen. Local residents can farm plots in the ReFresh Community Garden. It's part of a health hub project established on long-vacant commercial property. It was at this cafe that Marlon Schaffer began to pull things around. He was a 10-year-old kid living in the Iberville housing project when Katrina hit, and his family had to evacuate. They tried the Superdome and the convention center in the city, only to find both of them too crowded. They ended up spending a week sleeping outside the convention center, before the Army moved them to Austin, Texas. After a year there, surviving on a check from the Federal Emergency Management Agency, his mother moved them home to New Orleans — but even then she couldn't find work. So he says they basically squatted in the abandoned Iberville project for the next year. "You know life? It's just really been crazy. Like we still been struggling ever since, and stuff like that," he says. "I'm just trying to do better for myself 'cause I'm not that type of person." Schaffer dropped out of school in the ninth grade, but he found work at Liberty's Kitchen — and he helped build the ReFresh Community Garden. "I actually planted those poppy seeds right there," he says, laughing. The cafe and the garden helped provide a new start. He's working in Atlanta now, but when he's back home for a visit, he comes back to the garden for refuge. "For some reason when you come together as one in a garden ... it's like your soul relaxing," he says. "You're at peace. I'm happy right now standing in the garden."